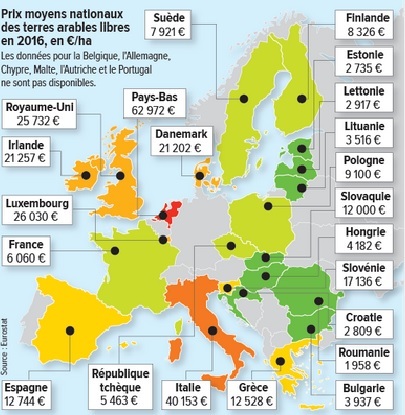 New figures out from Eurostat on 21 March show that the most expensive agricultural land in some 20 European Union countries lies in the Netherlands, fetching an average of €63.000 euros per hectare (€791 for rental), and in the region of Liguria in Italy where land sells for €108.000 per hectare. Romanian farm land is the cheapest at €1.958 euros per hectare. The price of agricultural land in France is cheap in comparison with its western neighbours, selling at just €6.060 per hectare, one tenth of the asking price in the Netherlands, and under one quarter of the price in the UK (€25.732). Figures are for the year 2016. See the press release here. 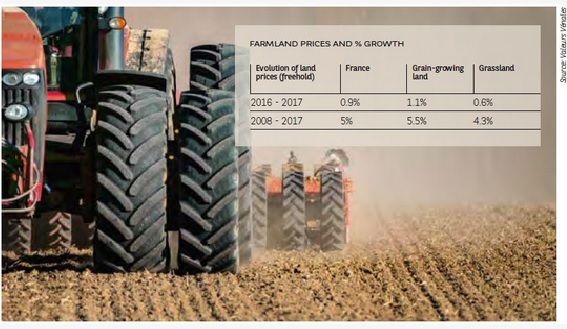 Agricultural land in France went up on average 5% per year from 2006-2016, but has since slowed down considerably to 0,9% following serious damage caused by floods and other problems in the agricultural sector particularly in the animal breeding sector. See 2018 Agrifrance Annual Report. However, forestry in France is booming, with forest land prices rising; demand is much stronger than supply. 30 000 hectares of land in France went to urbanisation in 2016, a rise of 22 per cent in just that year*, a trend which the government has said it wishes to stem with new ecological measures. Some of France’s most fertile soil has been lost to Disneyland, Roissy and Le Bourget airports and more will be lost to the Grand Paris project promoted by ex-President Sarkozy: construction there is presently being carried out on particularly rich and fertile land composed of silts that are 4 to 5 meters deep. New figures for the price of land in the French regions are published each year by the Droit des Finances website here: land prices for 2017 will be made available in September 2018. Other figures on French land can be found here. Some French farmers are turning to the Ukraine to work the rich soil there. Land there belongs to small landowners and is not for sale, but can be rented at rates which were once cheap but which are rapidly rising along with demand. But winters are rough in the Ukraine, and recent military conflicts mean that conditions are not easy: French farmers do not actually live there but group together and work on a rota system, taking it in turns to work the land, returning to France to hand over to the next team. The Ukraine government welcomes this move. The administrative paperwork needed to set up is complex and laborious, but this is something the French are familiar with given France’s notoriously heavy bureaucracy. But the main pull is that the Ukraine is not part of the EU and is therefore not held by EU agricultural regulations. Whereas in France – and other European countries – much of the once fertile soil has been damaged by the long and persistent use of chemicals for intense farming – or as mentioned above has been built on, Ukraine’s soil is still very rich. That is until farmers spread those chemicals and continue free-handed those practices which are now being prohibited in the EU. *See 2017 report published by SAFER, the French land development and rural settlement companies which play a major role in rural spatial planning. For French official agricultural statistics, click here.